Posters were quite common on some British Railways vans during the 1950's and 1960's. Some regular heavy users of BR freight stock would stick posters on the doors or sides of vans as a form of publicity. These posters are very rarely modelled even though they were quite common in the BR steam era. Having made some of my own in the past using a DTP program on my computer finding accurate pictures and designs of suitable prototype posters wasn't easy. However last Sunday I visited "Midland Railex" at the Midland railway Centre Swanick Junction site. One of the first things I came across were a selection of wagon posters made by Sankey Scenics. having bought a couple of packs this post shows the results of using this great product. 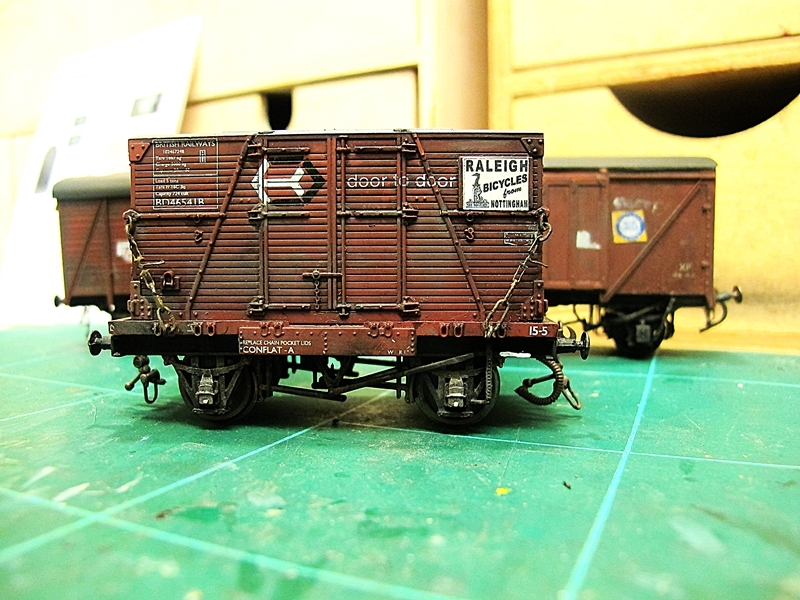 The first item of rolling stock I decided to try them on was this container on a conflat A.
I used a "Raleigh Cycles" poster on one side and a "Cyril Lord" carpets poster on the other side. that way I get two items of stock for the price of one! as at exhibitions the viewers only see one side of the container at any one time. Turning the wagon round changes the entire look of the container giving the impression that it is a different item of stock! here are the results of a couple of hours steady work. I also added some "chalk" markings to some of the vans. Railway staff would use chalk to mark the van with destinations and so on. some would be rubbed out but others would be left with a line though it after the new destination had been marked on the van. I used a white ink pen for this, available from most art and craft stores for a couple of quid. Where old posters have been ripped off there is almost always some paper left behind and to replicate this I used the gummed edge of cigarette papers. stuck on and then distressed with a scalpel. Finally I weathered the posters slightly with a graphite pencil. 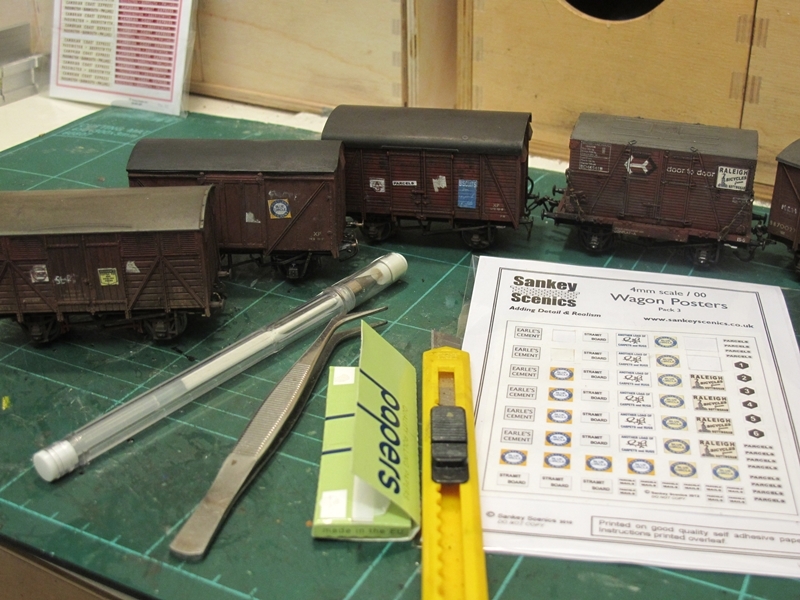 All in all I'm quite satisfied with the results and would recommend this product to anyone who wants to add a bit more interest to their rolling stock. Edited to add.... Yes I know about the bent buffer in the photographs, this has now been repaired and the van is back in my serviceable ready to use stock box! 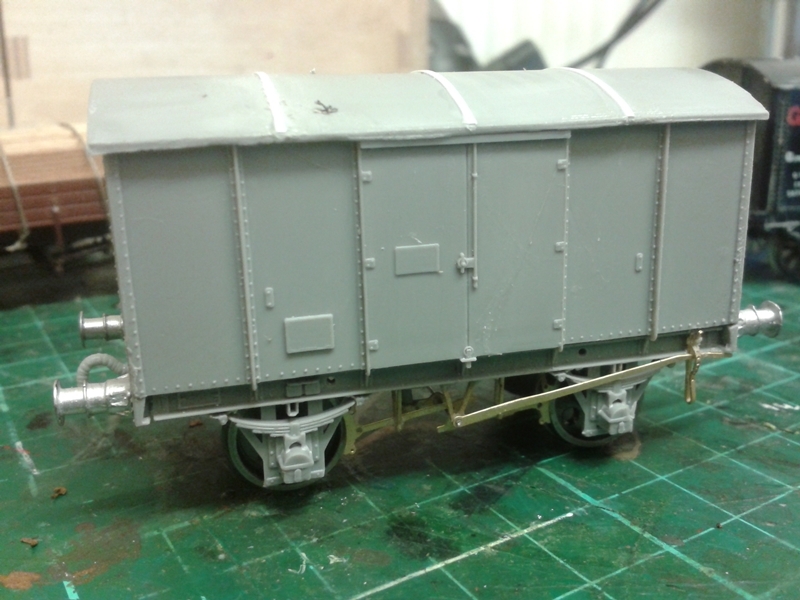 Latest job on the workbench is this Parkside ex GWR Gunpowder van. Very much a WIP. I am going to need at least 3 of these for my new layout "Steam on the Cambrian"
Note that I have modified the Parkside kit to represent a van of diagram Z4 rather than the Z2 as Parkside intended. This meant changes to the brake gear, for which I have used Mainly Trains brass etches. Strangely enough Parkside included vacuum cylinders in their kit even though the Z2 was unfitted! I have also used white metal buffers as the plastic ones supplied are much too vulnerable to damage especially when using screw couplings. Still to be fitted are the braces between the W irons and screw couplings. No transfers supplied but I have been told that they are available from Cambridge custom transfers. More news once it's finished and painted.